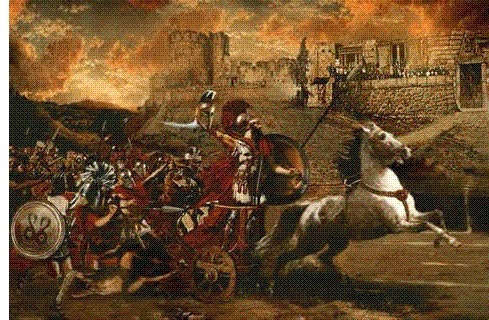 The Trojan War - Regardless of which battle is the first ever recorded in history, without a doubt, the most famous conflict before 1000 B.C. cannot be debated. It is the Trojan War. All thanks to an obscure Greek bard named Homer. In ancient times, the Trojan War was accepted as an historical event; but by modern times, it had come to be regarded as mythology. The exploits of the great heroes of the war, Achilles, Hector, Odysseus and others, seemed just too fantastical to be true. But in the late 19th century, one man defied modern conventional thinking and sided with the ancients. And he had the ambition and resources to try to prove it. His name was Heinrich Schliemann, German businessman and pioneer in the field of archaeology. In 1871, he began excavating a hill in northwest Anatolia called the Hissarlik. In archaeological terms, this type of hill is known as a tell, which means it is an artificial mound built up over the centuries by a human occupation in the past. Schliemann's methods were very crude by modern archaeological standards. He used dynamite to blow his way down to the site and destroyed many artifacts in the process. Nevertheless, he discovered the remains of a city and ignited the public's imagination by what he found. In reality, Hissarlik contains a total of nine levels representing the whole history of Troy, but Schliemann stopped at the second believing that one to be the "city of Priam". Later excavations showed level VIIa to be the Ilios (another name for Troy) of the Trojan War. It contains evidence of widespread destruction caused by man and not natural disaster, including scorch marks on several of the buildings. Also found were partial human remains scattered throughout, both inside dwellings and in the streets, including a skeleton with injuries consistent with warfare. And bronze arrowheads were found as well. The period of this event likely dates to sometime between 1300 and 1200 B.C. Homer's Iliad is the romantic version. Helen was the woman whose "face launched a thousand ships". The true cause of the war is not known, but many historians think the conflict was economic in nature. Being located at the mouth of the Hellespont, this is a pretty good guess. Perhaps the Greeks were trying to open up trade into the Black Sea and the Trojans wanted to prevent it. The disagreement was settled the old-fashioned way...by war.